This artifact is a group blog and video presentation. My professor, Dr. Desjardins tasked us with finding a new pedagogy that used technology to achieve something previously impossible. My group chose student centered learning, or student driven learning, as a method that might revolutionize education. Looking back, the concept is not overly innovative, but the blog is my first major assignment in the masters and really motivated me to challenge my assumptions about education. Though I never came up with a new pedagogy, in retrospect my posts reveal my interest in adult education and online learning, which has become my area of focus. The video consolidates our group blog and seminar presentation experience. My blog in Online Technology in Education course was my first group work assignment in the program, and my first time in a long time collaborating, from a student perspective. I had worked with colleagues on projects in my teaching job (planning assemblies, concerts, masses, professional development), but not in my Additional Qualification or Human Resource Management courses. Online group work and collaboration seemed a nightmare (a preconception) for a busy professional like myself. The group work was challenging, but also fruitful. Student Centered Learning is an educational approach that focuses on the needs of the student, affecting the design of curriculum, course design, and course content. It is the focus of my blog artifact for Online Technology in Education. SCL results from a paradigm shift: from the idea that knowledge is transferred from faculty to students, toward the idea that students learn by discovery and construction of knowledge (Froyd & Simpson, 2008). The focus of instruction and assessment in SCL is learning, not teaching. Instructional methods include active learning experiences like problem solving, critical thinking, role-play, and cooperative learning, not lecturing and textbook work. In Student Centered Learning, students influence the content, activities, materials, and pace of learning. The instructor provides students with opportunities to learn independently and from one another, and coaches them in the skills they need to do so effectively. For my SCL blog assignment we wrote about SCL, but the assignment itself was student lead. We decided what and how to present our information to the class, and what direction to take our investigation, resulting in a memorable experience. SCL can lead to increased motivation, greater retention of knowledge, deeper understanding, and more positive attitudes toward the subject being taught (Collins & O’Brien, 2003) which was the case for me in this course. I recall feeling lost due to the freedom of this assignment. This feeling is what my group experimented with in our presentation, as mentioned in the video included with this artifact. Without any instruction whatsoever, at the start of our seminar we sent our classmates out to learn something of their choosing. This activity, and the ensuing confusion it caused, spoke to the challenge of facilitating SCL. Just as the students in the video were unable to imagine a more effective learning environment, our classmates were at a loss as to where and what to start learning. It also brought up questions about the nature of learning and the difference between information and knowledge. For me this highlights the vital role of the teacher and the art of guiding learners without inhibiting them. As I hope my portfolio demonstrates, this is a problem I pondered throughout my course work. Blogging was something I had done before starting the M.Ed, but an M.Ed class provided the largest and most highly educated audience I had ever written for. The blog format worked well for attempting to arrive at a new pedagogy because participants responded to both instructor posed questions and peer blog posts, though it was intimidating putting my ideas on the internet at first. I also reflected on my learning and our classroom discussions, and my professional practice. Some of us were even able to write about implementing our ideas in their own schools and classrooms. Responding asynchronously (and having time to consider and research before responding) engaged us in reflection and social learning. We participated in student centered learning while writing about it, and employing it in our teaching. Having now spent more time in the program, the ideas in my blog contributions were not overly innovative. As I re-read my posts I see hints of theories and ideas that I have since been explicitly exposed to in other courses, and in my own research. I see now that we were identifying gaps that experts in education had been researching for years, but the power of discovering it for ourselves in an authentic way, was motivating and fulfilling. Though I don’t think we answered Dr. Desjardin's question of "what is the new pedagogy", my interest in doing so was ignited. There are other approaches overlap with Student Centered Learning, including Active Learning, Collaborative Learning, Cooperative Learning, Inquiry-Based Learning, Problem-based Learning, Peer Led Team Learning, Team-based Learning, Peer Instruction, Inquiry Guided Learning, and Just-in-Time Teaching (Froyd & Simpson, 2008). The format of our assignment and the way we worked in this course also used problem-based learning, the collaborative learning approach, and social development theory which I have briefly outlined below. Dr. Desjardin and my classmates modeled use of these educational approaches while we all participated in them. As I will discuss throughout this portfolio, explicit content specific examples are paramount for adult learning. This course and its assignments are examples of this idea in action. Seeing the positive results of these approaches in use has encouraged me to use them more effectively in my teaching practice and provided valuable experience in their execution. Problem Based Leaning is an educational approach which advocates experience-based learning. PBL is an instructional method whereby students learn through problem solving and the teacher serves as facilitator to guide students through the learning cycle, which is depicted below. Flexible knowledge – beyond facts, students need to integrate information across multiple domains. Intrinsic motivation – an engaging problem will motivate by appealing to learners’ own interests, challenges, and sense of satisfaction. 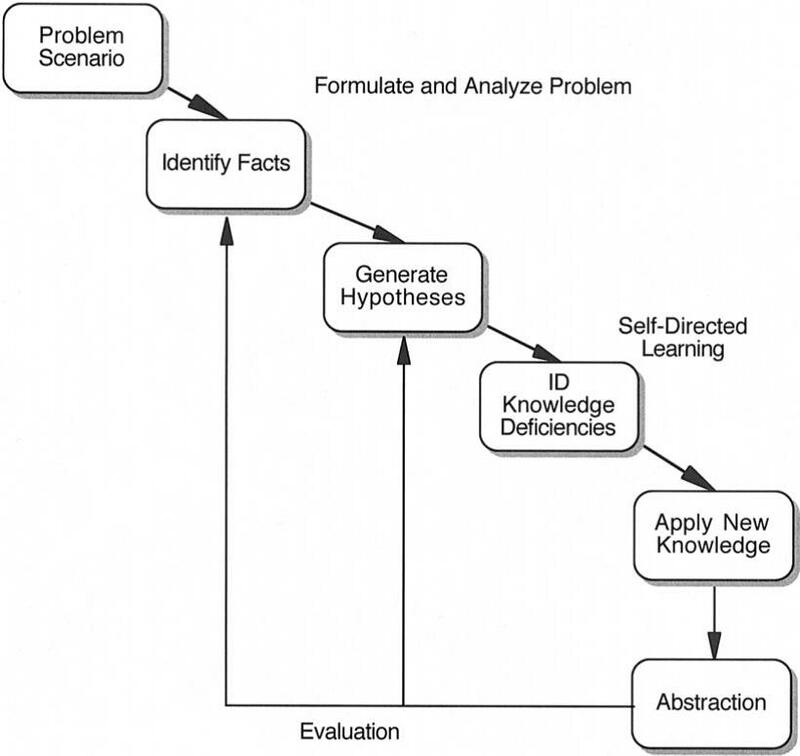 This image is from Problem Based Learning: What and How do Students Learn? by Hmelo-Silver. The PBL approach shows students that there can be more than one correct answer to a problem. In PBL students “engage in self-directed learning (SDL) and then apply their new knowledge to the problem and reflect on what they learned and the effectiveness of the strategies employed” (Hmelo-Silver, 2004, 235). In my experience in the M.Ed program, there are no wrong answers. When I was presented with new ideas I was encouraged to apply my experience and prior knowledge, and reflection was always part of any evaluation. Cognitive load theory, the load related to executive control of working memory, points to one potential drawback of PBL, called “guidance-fading effect” (Sweller, 2006). If PBL is introduced too early in the learning process, students are not able to deal with working memory limitations and may find it difficult to process large amounts of information in a short amount of time. According to Sweller (1998), schemas are structures of long term memory that allow us to solve problems. Because they are acquired over a long period of time, a student may not have an adequate amount of information to solve a problem. I included this theory because it relates to students' hesitance or inability to think outside of their current learning context (i.e. what would you ideal school look like?). The support SCL and other student centered approaches students still need a solid base of subject matter knowledge and context. Collaborative learning is an educational approach that focuses on students working together on learning tasks. Collaborative learning is “based on the idea that learning is a naturally social act in which the participants talk among themselves” (Gerlach, 1994). Learning is an active process whereby students assimilate information and relate it to their framework of prior knowledge. Learning requires a challenge, not memorization and regurgitation. Learners benefit from diverse viewpoints and interaction with people from varied backgrounds. Learners do best in a social environment where conversation takes place between learners. By articulating and defending their own ideas, learners create unique conceptual frameworks. Dr. Desjardin’s class was very social in nature. My classmates were outgoing and enthusiastic. Everyone participated to the extent that whole-class discussion became a challenge. A bit frustrating and intimidating at the time, I see now that social learning was occurring. Social interaction plays a fundamental role in the process of cognitive development. The More Knowledgeable Other (a person with a better understanding or higher ability with respect to a particular task. The Zone of Proximal Development is the distance between students’ ability to perform a task with guidance, and his ability to do so independently. Social Learning Theory emphasizes the importance of observing and modeling behaviours, attitudes, and emotional reactions of others. Most human behaviour is learned by observing others, then coding the information as a guide for action (Bandura, 1977).